Do You Write To Strangers? Have you ever left a card for a complete stranger to find? If not, we’re happy to introduce you to the MoreLoveLetters.com movement. Hannah Brencher created More Love Letters after writing 400 love letters to strangers over the course of a year. Now, her organization encourages people around the world to do the same to “lift, empower and mobilize individuals through tangible acts of love.” People who find these notes tucked away on shelves, left behind on a chair, sitting near a swing, have commented that reading these words of encouragement and inspiration from complete strangers makes them feel valued, understood and encouraged to continue through tough times. 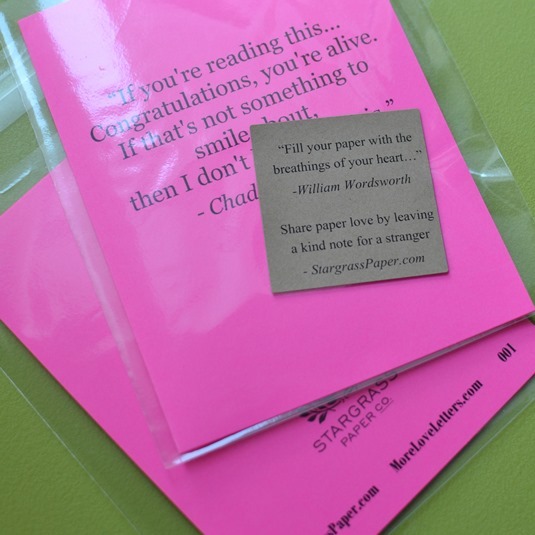 For that reason, with every StargrassPaper.com order, we’re including a free “card for a stranger.” We’ll get you kicked off with a quote on the front, but it’s up to you to write something from the heart on the inside. It doesn’t have to be long or particularly profound. It’s a nice note with your words of encouragement. And when Hannah began writing those notes years ago, she found that leaving notes for others helped her get through her own tough times! You can learn more about Hannah by watching her TED talk. We’d love to see where you leave these notes! Take a picture of your note and tag us on facebook or send an email to hello@stargrasspaper.com. In the meantime, we’re excited to hear if any of you have already left a kind note for a stranger – please take our poll and let us know! I like the pink paper! I’d order that. I don’t write letters to strangers tho. Not a good idea nowadays!! !